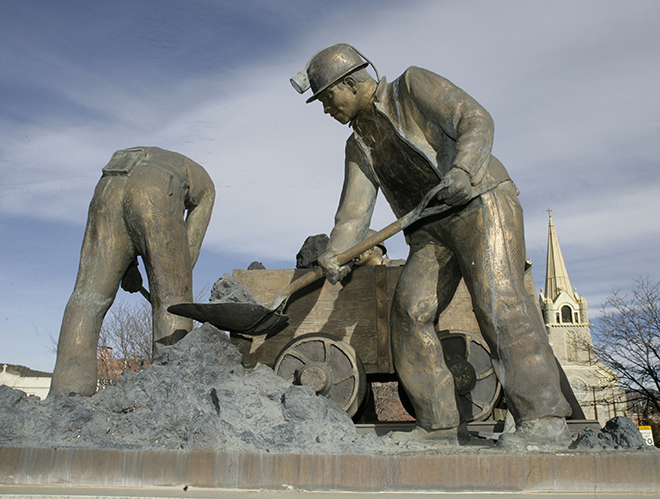 A sculpture in the center of Trinidad, Colo., stands as a monument to coal miners. New legislation proposed in the state would allow for low-cost bonds for utilities interested in retiring coal plants early. Some of the savings the program generates would be made available to transition communities that depend on the retiring coal facility. A Colorado lawmaker who wants to make the state an example of how to transition away from coal could have a clear shot at passing legislation aimed at making an energy transition more financially palatable to ratepayers and power generators. Opponents of burning coal are increasingly pushing policies to accelerate the retirement of coal-fired power plants in the U.S., which have continued apace despite a deregulatory push from the Trump administration. In Colorado, a recently introduced bill poised to sail through the Democrat-led legislature would create consumer-backed bonds to retire coal plants early; part of the proceeds would provide financial assistance for affected workers and communities. "I think the number one concern is that the [investor-owned utilities] don't want the tool to shrink their balance sheets, and I'm very sensitive to that as well. We want the utilities to have a chance to refresh their portfolio in a very financially efficient way, so we're working closely with them to make sure we can manage that issue together," said Colorado state Rep. Chris Hansen, the Denver Democrat behind the Colorado Energy Impact Assistance Act. "We can see the handwriting on the wall. We know these coal plants are aging, we know some of these assets are going to need to be retired." Amy Cooke, executive vice president and director of the Energy and Environmental Policy Center for Colorado free-market think tank the Independence Institute, called the legislation's aim to issue bonds without the vote of taxpayers "appalling." At some point, rising costs or reduced reliability from the state's efforts to interfere with the electricity market will harm electricity consumers, she predicted. "Ratepayers will have to pay it," Cooke, who opposed a 2017 version of the bill, said in a Jan. 11 interview. "This is a bond dealer's dream. It's a Big Green Machine dream. It's a nightmare for working families in Colorado who have to pay for that." Coal remains a major source of electricity in the state, generating 48.7% of the state's energy in September 2018, according to the U.S. Energy Information Administration's latest data. But renewable energy generation has rapidly expanded in recent years and accounted for 19.4% of generation in the same period. Replacing all of Colorado's coal plants with a mix of wind, solar, natural gas and battery storage could save the state's electric customers $250 million per year — roughly $2.55 billion in net present value through 2040 — with little impact on reliability, a recent analysis from energy researchers Vibrant Clean Energy found. The savings calculated in the analysis include repaying the remaining capital on the state's coal-fired power plants. Roughly 42% of global coal power plants are already unprofitable, according to a recent Carbon Tracker Initiative report warning of the dangers of stranding billions in generation capacity investment. With coal's profitability falling behind in other parts of the nation, legislation that could create a "win-win-win scenario" across a diverse group of stakeholders could easily be deployed in other states, said Eric Gimon, a senior fellow with Energy Innovation, an organization with a mission to "accelerate progress in clean energy." "Nobody's going to want to keep running these things forever. But if you can be on the leading edge through this kind of mechanism, you can collect some of this transition assistance, and I think that's a plus for these communities," Gimon said of the Colorado bill. "There's a real incentive to accelerate the retirement of the coal fleet, apart from the environmental factors, and these mechanisms are going to be necessary to make that happen." Energy Innovation and the Sierra Club both recently published papers aimed at rolling out legislative pathways in different U.S. states that would accelerate the retirement of coal-fired power plants using green tariffs, securitization, capital recycling and other financially oriented tools to reduce potential disruptions from an accelerated transition away from coal and other fossil fuels. A portion of the proceeds from Hansen's proposed energy impact assistance bonds, available to any utility in the state, would be dedicated to funding transition programs to help Colorado workers and communities directly affected by the retirements. The bonds would be repaid through a special energy impact assistance charge, separate from the utility's base rate, that would be continually adjusted to achieve the highest possible credit rating, allowing the bonds to be issued at low interest rates. While a version of the bill could not get across the finish line in 2017, it has a strong chance of passing in 2019. Hansen's fellow Democrats took control of the state Senate in 2018 and widened their majority in the House; the new governor, Democrat Jared Polis, won on a platform of transitioning the state to 100% renewable energy by 2040. "I think Captain Obvious would say the bill is going to pass," said Stan Dempsey, president of the Colorado Mining Association, which opposed the 2017 version of the bill. Though the organization has not yet officially taken a position on the latest version of the legislation, Dempsey said he questions whether lawmakers, policymakers and ratepayers understand the potential costs of creating bonds that would allow the industry to accelerate coal plant retirements in the state. "Why in Colorado does any utility need the financial instrument when, you know, a number of utilities have either switched away from coal or have switched away from coal or shut units down already?" Dempsey said, adding that his group is reviewing the bill. "What benefit does this tool bring to Colorado, either the utilities, the ratepayers or the communities?" Xcel Energy Inc., a company already shutting down coal generation and replacing it with renewable energy and natural gas projects in Colorado, has not yet taken a position on the new bill either. The company has publicly said it would hit an 80% carbon emissions-reduction target by 2030 and is aiming for zero emissions by 2050 as it transitions its own fleet. However, the company has not run into the kinds of issue Hansen's bill aims to address, said Mark Stutz, a spokesman for Xcel Energy's Colorado operations. "For example, we have had virtually no issues with addressing workforce at our facilities as employees have been able to find positions in other parts of the company, chosen to retire, or found other opportunities," Stutz said. "Likewise, we are cognizant of the impact of the closure on local communities, and we have found ways to reinvest in the community."